Field Work VIMS Assistant Professor Matt Kirwan on Hog Island, VA where he is simulating the accumulation of over-wash fan deposits to measure the impacts of storms on marshes. Photo by David Walters. Marsh Studies VIMS Assistant Professor Matt Kirwan in the field. Photo by David Walters. Assistant Professor Matt Kirwan of William & Mary’s Virginia Institute of Marine Science has earned a Faculty Early Career Development award from the U.S. National Science Foundation to support his studies of how coastal marshes respond to sea-level rise. Kirwan’s 5-year, $677,000 award will support field, laboratory, and classroom activities that “build a firm foundation for a lifetime of leadership in integrating education and research.” It includes research support for three post-doctoral fellows and graduate students, as well as six undergraduates. A 2002 graduate of W&M with a B.S. in geology and a minor in mathematics, Kirwan earned his PhD in 2007 at Duke University. Since arriving at VIMS in 2013 from a research assistant professorship at the University of Virginia, he has authored or co-authored 14 articles in leading research journals including Nature and Science. He currently mentors six students and teaches two courses—Principles of Geological Oceanography and Wetland Geomorphology and Ecology. His work on the “ghost forests” shaped by rising seas has been covered by NBC and ABC News, the Associated Press, the Atlanta Journal Constitution, the Houston Chronicle, and scores of other newspapers. The specific goal of the research and teaching activities Kirwan laid out in his successful CAREER proposal is to combine lab and field studies with computer modeling to determine and predict how the carbon stored in coastal marshes will respond to sea-level rise. 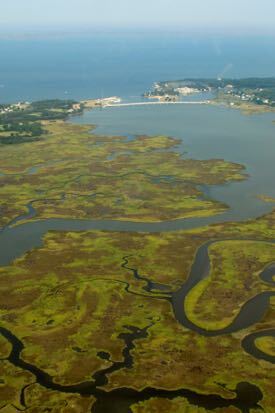 Chesapeake Bay is home to some of the most extensive marshes in the world. “Coastal marshes sequester about half of all the carbon held in marine environments,” says Kirwan, “but we know very little about how that carbon will respond to rising seas or to construction of levees and other coastal infrastructure.” Carbon buried in marsh sediments contributes little to current global warming, but will increase temperature and ocean acidity if released as carbon dioxide to air and seawater. Kirwan and his team of students and laboratory technicians will pursue their studies by combing through historical maps, sampling marsh soils, and using what they find to develop and refine computer models to predict how the size and carbon content of coastal marshes will respond to future rises in sea level.